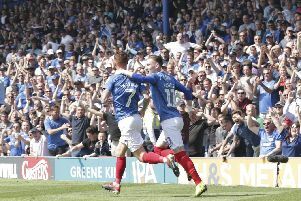 Stuart O’Keefe is relishing his return to Pompey – but admit’s he’s not sure what sort of reception he’ll receive from the Fratton faithful. The midfielder spent last season on loan at the Blues from Cardiff, making 25 appearances and scoring twice. O’Keefe has joined the Pilgrims for the remainder of this campaign after being deemed as surplus to requirements at the Bluebirds. He’s set to feature for Derek Adams’ side today when they visit Pompey. Another fiery battle between the port rivals is expected. The former Crystal Palace man is hoping for a warm welcome from Blues supporters. But he knows that’s not guaranteed because he’ll be donning Plymouth colours. ‘I will find out about three o’clock on Saturday,’ O’Keefe told the Plymouth Herald. ‘Hopefully, it won’t be too bad. ‘I did try my hardest for them so we will see. ‘Both clubs have got ambitions to get out of the league sooner rather than later. It will be a good game I am sure. ‘We need to get points on the board in the league and Fratton Park, as I know, is a tough place to go. ‘We need to make sure we are right and ready for that because it will be hostile. It will be a fantastic game to be involved in if I’m picked. ‘There is a rivalry because of the naval bases but it’s not really a rivalry geographically. O’Keefe enjoyed his spell at PO4 last term – although a groin injury sidelined him for three-and-a-half months during the middle of the season. Nevertheless, he captained Pompey on several occasions last season in the absence of Brett Pitman and Gareth Evans – something he is proud to have done. He added: ‘I did like my time at Portsmouth. It’s a good club but it was frustrating as I got injured and I missed a bit of the season. ‘All in all, there are good people there. I have got some friends there and it was a good place to play my football for a few months. ‘I ruptured my groin when I was there so I had surgery in January. ‘But I captained Portsmouth for a bit before that and I’m looking forward to going back there.